Starting tomorrow Atlanta will host the annual NRA Convention. It should be yet another testament to the more and more extreme agenda of the leadership of the NRA. Nationally and in states all over the country, the gun lobby’s leaders and lobbyists have been pushing for ever more dangerous laws to undermine public safety. Donald Trump will speak at the convention on his 99th day in office. He must believe that the American public will find this to be one of his key accomplishments in his first 100 days. The accomplishment will be for the corporate gun lobby and, if you follow the money, for gun industry profits. As the National Rifle Association (NRA) prepares to kick off its annual convention in Atlanta later this week, a new national survey of gun owners finds overwhelming opposition to the dangerous policies and positions supported by the Washington gun lobby. The poll, released today by Americans for Responsible Solutions PAC, also finds that a many gun owners believe that the NRA has become increasingly out of touch with them on important gun safety issues and shows that a majority of gun owners believe the NRA has lost its way, straying from its original purpose and mission. (…) The poll illustrates a disconnect between the views of gun owners and the priorities being pushed by the gun lobby. Key federal legislative priorities named by the NRA, including federally mandated concealed carry, deregulating the sale of gun silencers, and eliminating gun-free school zones, receive very low support from gun owners themselves. The right-wing conservatives now ascendant in Washington are not so shy about their ties to the gun group, and the NRA and its allies are championing policies that would formerly be regarded as fringe. At the federal level, the NRA’s top legislative priority is a bill that would require states to honor each other’s laws governing the concealed carrying of handguns. Another gun-rights measure pending in Congress would legalize silencers, and a third would abolish gun-free school zones. The NRA now has a “seat” at the White House like in no prior administration. The NRA spent $30 million to get Donald Trump elected. The NRA spent political capital and actual capital to make sure that the open Supreme Court seat went to someone they wanted- Neal Gorsuch. At least one NRA Board member, Ted Nugent, has dined at the White House with Donald Trump- last week. You can’t state clearly enough how offensive Ted Nugent has become and yet still retains a Board position with the NRA. Why was he dining at the White House along with someone who seems to share his views- ex VP candidate Sarah Palin- the one who shoots bears from a helicopter and loves her guns. Ted Nugent is not what we would call a fine upstanding citizen who should be dining with any President in my opinion. The NRA’s extreme agenda is now in the “mainstream” of our government and will be apparently pushed by our very own President. Americans continue to die from gunshot injuries at the alarming rate of 90 per day and around 32,000 a year. Mass shootings continue on a pace more rapid than in past years. Veterans are shooting and killing themselves in gun suicides daily but the House and perhaps the Senate will decide that not only is that OK, they will make it more possible. Alex Jones, right wing conspiracy theorist and who believes the Sandy Hook shooting was a hoax, is a friend of our President. Common sense is nowhere to be seen at the federal level concerning a national public health epidemic. Americans generally do have common sense about gun policy, but as long as the corporate gun lobby has a hold on our political leaders, the public’s wishes will be ignored. “Corporations are people” but corporations don’t get shot and killed. The gun lobby is a corporation formed by the gun industry and the leaders and lobbyists of the pro gun movement. As long as this is the case, we can expect to see shootings continue unabated. While the NRA has been placing friends and allies in the Trump Administration and getting favors in return, it has also been relying on relationships with legislators and even President Trump’s own family to push its legislative goals in Congress. NRA allies in Congress and the White House have already delivered some quiet victories for the gun lobby that will endanger public safety. In February, Congress passed and President Trump signed legislation behind 3 responsiblesolutions.org #ResistTheGunLobby closed doors that eliminated a President Obama-era rule that prevented mentally impaired individuals from accessing firearms.12 The rule had required the inclusion of records into the NICS background check system of recipients of Social Security disability benefits who also required a fiduciary representative to manage their benefits because of a disabling mental disorder.13 And in March, the House of Representatives passed legislation that would make it harder to keep guns out of the hands of veterans with severe mental illnesses by effectively prohibiting the Veterans Administration from sharing those records with NICS while also removing the 174,000 records already included in the system. This will put the veterans who most need our support at increased risk of doing harm to themselves or others. The most recent statistics available from the VA found that an average of 20 veterans per day die from suicide.14 While these are early victories for the NRA, their real agenda is focused on policies that would undermine law enforcement and put public safety at risk, making communities across the country less safe. Revenge. What is that exactly? And what are we talking about here? What I am talking about is public health and safety and protecting lives. The NRA and corporate gun lobby don’t seem to care a whit about that because… rights……money……loyalty…….power……control……..business. The film star stands tall at the National Rifle Association’s National Firearms Museum — true, only as a cardboard cutout of himself. But the cardboard fantasy of the good guy gunning down the bad guy is what makes the museum work as an enjoyable escape from the life-and-death reality of American gun carnage. There are thousands of ingenious, gleaming rifles and handguns in displays about America’s gun-rich history of colonialism, immigration, expansionism and vigilante justice. But it is the gallery devoted to Hollywood and its guns and good-guy shooters that best illustrates the power of fantasy now driving the modern gun rights debate. “Go ahead, make my day,” Clint Eastwood growled famously to a movie bad guy before dispatching him — kaboom! The museum narrative identifies the actual movie guns, not the actors, as having the “starring” roles in assorted western and terrorist-fantasy shootouts. The gallery includes some of the blank rounds actually fired in movies, as opposed to the live rounds bedeviling real life beyond the film screen. During a visit, the difference between “acting” and “acting out” necessarily comes to mind. Why is there no stream of gripping films about the thousands of troubled Americans with easy access to guns who can lethally act out their darkest grievances on family and society day after day? Shooters nowadays must rise above the B-movie level to get noticed amid the 30,000-plus annual toll of gun death. They need a different twist in motive or a record-high death toll — or maybe the live delivery of death on Facebook, as happened last week — to jolt a jaded public. Inert politicians, of course, remain far more sensitive to the gun lobby than to routine gun mayhem. (…) The N.R.A.’s latest priority is rooted in its ultimate fantasy that society will be safer if ordinary Americans are allowed to routinely pack a pistol. The organization is pushing Congress to pass a national concealed-carry reciprocity law to make it easier for people with state concealed-gun permits to carry their firearms nationwide. This is part of the campaign to make gun possession ubiquitous among ordinary citizens. All states permit some concealed carry, but under vastly different safety controls. That is why opponents wisely fear that national reciprocity is a ploy to sell more guns and undermine stronger local and state gun controls. Fantasyland for sure. Evidence and real shootings every day lend the lie to the fantasy about more guns making us safer. Survivors and family members have found out that what they see on TV or in the movies is fantasy. What happens in real life is no fantasy. The NRA is out of touch with gun owners on gun safety issues. 67 percent of the gun owners feel that the NRA used to be an organization dedicated to gun safety, but it’s been overtaken by lobbyists and the interests of gun manufacturers and lost its original purpose and mission. Less than 50 percent of gun owners feel that the organization represents their interests. It’s past time for a change. As the myths and fantasies of the NRA continue to be perpetuated by those at the top, including now our President, people are dying. It doesn’t have to be this way. Despite targeting a civil rights hero, the NRA has routinely attempted to co-opt the civil rights movement by, among other things, calling gun regulations “equally as unconstitutional” as Jim Crow laws and bemoaning that “too many Americans don’t think of the Second Amendment as a civil rights issue.” In August 2015, NRA’s Institute for Legislative Action media liaison Lars Dalseide compared a Seattle ordinance that would fund gun violence research by imposing a tax on the sale of guns and ammunition to Jim Crow-era poll taxes. The NRA can in no way be compared to our nation’s real Civil Rights organizations and actions taken to push for those rights. The organization was founded on the idea that it would support hunters and hunter and gun safety. The fact that the leaders and lobbyists use their efforts to increase profits of the gun industry and their control over elected officials by couching it in civil rights language is dangerous and fantasy. I am betting that even many who pay their dues to the organization have no idea that the leaders make this claim. Nugent is no Rosa Parks. Wayne LaPierre is no John Lewis. False facts are not facts. In my recent post, I wrote about the 10th anniversary of the Virginia Tech mass shooting. That mass shooting occurred on April 16, 2007- ten years ago. “April is the cruelest month” wrote T.S. Eliot. The poet could never have predicted how true that has become for America. The poem deals with depression and what April can mean for those who are suffering from depression. Eliot’s poem takes on new meaning considering those who suffer from grief and loss over loved ones shot and killed and/or injured in the month of April. There are too many to count since 1999. Today is the anniversary of the Columbine shooting. Yes, remember that mass shooting? It was the first school shooting to really capture Americans as it unfolded almost in real time. It was the first one that made people wonder how it could have happened and also what in God’s name could we do to stop school shooters from randomly shooting classmates. An article with facts about Columbine provides us with the basics about the shooting. There are facts in the article but they were not fast. It was a slow moving shooting that day. The grief of the families and friends has not healed fast. Grief is under the surface until something triggers the day. A birthday. A holiday. And today, an anniversary of that day. The article names the victims. They were somebody’s son, daughter, niece, nephew, sister, brother, father, uncle, friend. They were real people who in an instant became named victims. We must also remember that 20 were injured and now live with their memories and injuries- physical and emotional. Some have already forgotten and don’t want us to remember. Others will never forget. Just as I will never forget the night I learned that my sister had been shot and killed. That memory never goes away. And those of us who have lost a loved one look back and wonder what could have stopped the event? Was there anything anyone could have done? Can we make sure other families don’t have to remember these anniversaries? We could, at the least, try to stop the shooters from easily accessing guns they shouldn’t have in the first place. Robyn Anderson, a friend of Klebold and Harris, bought the shotguns and the Hi-Point 9mm Carbine at The Tanner Gun Show in December of 1998 from unlicensed sellers. Because Anderson purchased the guns for someone else, the transition constituted an illegal “straw purchase.” Klebold and Harris bought the TEC-DC9 from a pizza shop employee named Mark Manes, who knew they were too young to purchase the assault pistol, but nevertheless sold it to them for $500. Research shows that background checks are effective when it comes to saving lives. States with universal background check laws experience 48 percent less gun trafficking, 47 percent fewer deaths of women shot by intimate partners, and 17 percent fewer firearms involved in aggravated assaults. States with universal background check requirements also have a 53 percent lower gun suicide rate, and 31 percent fewer suicides per capita than states without these laws. We CAN do something. We can pass stronger gun laws such as requiring Brady background checks on all gun sales. We can pass Gun Violence Protection Orders so that families and friends can ask that guns be taken from those who could be dangerous to themselves or others. We can pass stronger laws against straw purchasing. We can wake people up to the fact that if something doesn’t seem right, it isn’t and action is necessary. We can identify that there are risks to owning guns and casually selling them to just anyone. We can hold “bad apple gun dealers” accountable and make sure guns are not being sold or exchanged with people who clearly should not have them and end as crime guns. We can’t let Columbine be forgotten. That is what the gun lobby wants. If we forget the victims- their names and faces, maybe we will just go along and do nothing to cause “trouble” for politicians. They want to avoid the unavoidable. They want to gain the favor of the gun lobby who represent an increasingly small group of Americans who think that the “guys with the guns make the rules.” Or they just don’t want to deal with what has become a national public health epidemic. It is not and will not be easy. But that does not mean we shouldn’t do it. “For the first 10 days, I didn’t speak to the media at all. I was just in shock. […] And then suddenly, I was so angry knowing that the NRA was meeting in town that I went and spoke in front of 12,000 people. […]It can be shocking. After I spoke, I suddenly realized I’m going to start getting calls from the media, I’m going to start getting people who are angry at me. You really have to be prepared for that. We have our stories. We have the facts on our side. But the facts and our stories don’t seem to be enough. They should be but we are living in a world where big money speaks and makes policy that advantages corporations and thumbs its’ corporate and political nose at the victims and survivors. The truth is that on April 20, 1999, 12 students and one teacher were brutally and shockingly and unexpectedly murdered for no reason other than two seemingly angry and possibly mentally ill young men wanted to shoot other kids. There is no other explanation. What say you gun lobbyists and gun extremists? Is this OK with you? Is it just about mental illness? What if these two couldn’t have so easily accessed guns? What then? Wherever your journey takes you stay steadfast in your faith, love and friendships. Believe in things that are not yet seen. We have not yet seen the majority of America’s leaders step up to the challenge of gun violence. There is actually common ground on solving the issue of gun violence. The majority understands that doing something about this epidemic will save lives. It’s Easter tomorrow for those who practice the Christian faith. It’s also the Passover season for Jews. What will the victims and survivors of the Virginia Tech shooting be doing and thinking about on the 10 year anniversary of what was our nation’s most deadly and heinous mass shooting until the Sandy Hook shooting took the lives of 20 first graders and 6 educators and the Orlando nightclub shooting took the lives of 50- yes 50 innocent Americans? The grief of the Virginia Tech shooting victims is matched by the grief of 90 families a day after a gunshot injury became a gun death due to homicide, suicide or an “accidental” gun discharge. This is the daily carnage and the daily news in America in spite of holidays, families pleading for common sense and brave elected leaders willing to stand up to the corporate gun lobby and demand that the devastation be, at the least, reduced and at the most prevented. We know there is no way to stop all shootings but shouldn’t we at least try? When a public health epidemic that takes the lives of so many people every year (32,000-33,000) we always get busy to study why and then recommend changes or cures that can prevent the cause of the disease or cause of death. In America, instead, we are making things worse by loosening gun laws at the state and federal level. Why? Good question. I don’t really believe that the gun lobby wants people to die. They couldn’t could they? They must be affected by the photos and videos of all of the shootings that take place on a regular basis everywhere. So why do they resist gun safety reform and efforts to prevent shootings so vigorously? It’s a question that we must ask and it needs an answer. Following the money is one answer. Power and control is another. Perhaps because Virginia Tech’s fatality count was so high, most of the school shootings that followed didn’t receive the attention they might have in the decade prior to the massacre. Are these kinds of shooting becoming normalized to the public or is it they don’t want to hear about them because they feel helpless to do anything about them? They are NOT normal and we can’t let them become normal. It is simply not normal for someone to walk into a school and spray bullets around killing random, or sometimes, selected victims. And of course, the “everyday” shootings happen without much media coverage and every day, ordinary people’s lives are changed forever. You may know some of these people. They are living close to you- in your neighborhoods and communities. They are remembering lost loved ones every day. This is not normal. Memorials to victims have become normal. Flowers, candles, teddy bears, hearts, cards, bell ringings, stones. The permanent memorial was dedicated with a ceremony on August 19, 2007, four months and three days after the massacre. Thousands of people gathered on the lawn that day, sporting their Hokie colors of maroon and orange. The university president spoke. A bell tolled 32 times. Each original stone had been placed in a mahogany box with a hinged lid, like a miniature coffin. Later, the boxes would be delivered to the families of the victims. Uma Loganathan can hardly remember the dedication; grief seems to have blurred many of her memories from that time. What she does remember is that first semicircle of stones set earnestly upon the grass, their rough edges befitting of her sorrow. “Befitting of her sorrow”…. Can anything befit the sorrow we all feel after losing a loved one to gun violence? Or having a close call as did my friend Lori Hass, mother of a Virginia Tech survivor? Like other survivors, I got into this GVP movement because of what happened. But that’s in the past and what we’re working for is a future where there’s less gun violence and where we’re doing more to prevent it. Our goals are to take the evidence and the policies that work and begin to apply as many as are appropriate. For example, we understand that domestic violence situations become exponentially more lethal when there’s a firearm introduced. Road rage with a firearm can turn lethal. Confrontation in the streets become lethal when there’s a firearm. Toddlers have killed more Americans than terrorists if you look at the numbers over time — all because somebody was careless and left firearms out and unsecured. Lori Haas speaks during a vigil outside the U.S. Capitol on April 16, 2013, to remember those murdered and demand congressional action on gun legislation. We want policies that make us all safer. 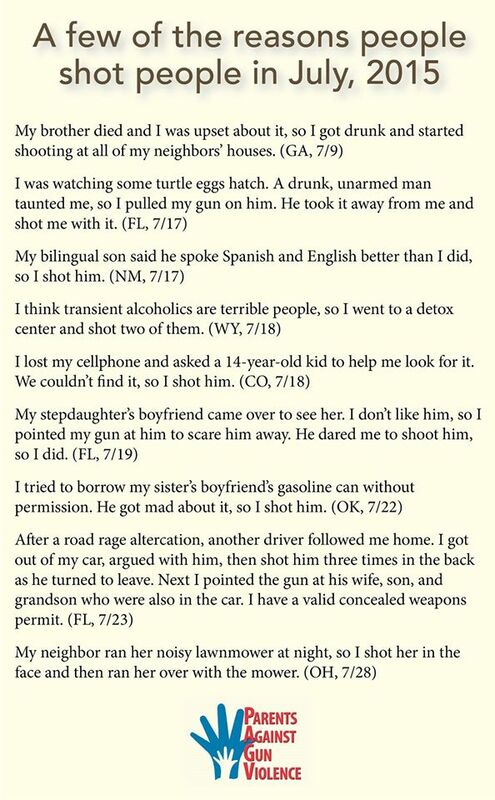 We think domestic abusers shouldn’t have access to guns. We think that there should be a background check on all buyers — how do you stop a prohibited buyer from purchasing a gun if you don’t do a background check to figure out if he or she is prohibited? We believe that you should have to have hands-on training around concealed carry. We think there should be penalties so that gun owners must properly store and secure their firearms so that children can’t get access to them. We think there should be limitations on the type of firepower that everyday citizens can carry on our street. The efficacy of a lot of those policies have been proven in other states and those states have fewer deaths. New York’s gun death rate per 100,000 is in the low, low single digits. Virginia’s is 10.9. It’s devastating for all of the families, me included, to relive the trauma each time another school shooting occurs. And you can’t help but relive it. What we’re also really traumatized by is the fact that someone else is now added to the club nobody wants to be in: the one where your loved one’s been shot and killed or injured. But [that] club is strong, the club is active, the club is compassionate and supportive. I know dozens of families from dozens of mass shootings. Every day we have gun violence in America, so there is a camaraderie that’s very understood by those [who have experienced it]. Ten years ago tomorrow, the feelings will re-emerge of how things went down that day ten years ago. Lori gives a very moving testimony to how one family experienced the horrendous shooting of 32. Tomorrow will also be Easter. A stone figures prominently in the Easter story. Stones can be moved but they are hard to move and they are hard to destroy. Tombstones are made of stone for a reason. They signify a marker where a loved one is buried and they are there mostly forever. So are the memories of our lost loved ones. Tomorrow, please remember these 32. See their photos. Say their names. 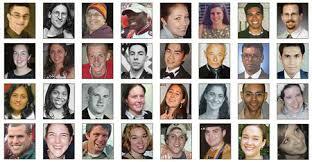 Families have approved and released these official biographies and photos of our 32 fallen Hokies. Please join us in remembering and honoring their lives by clicking on their names or photos. And then work with Lori Hass, Colin Goddard, Andy Goddard and the millions of us involved in preventing the next one of these shootings. Colin has been an advocate for gun violence prevention since he was shot and injured in the shooting. The film, Living for 32, features Colin’s story and his efforts to expose the lack of Brady background checks on all gun sales. We should not have to erect stone memorials to victims. We should not have to move stones to get the attention of the public and elected leaders about our deadly gun violence epidemic. We should expect that our leaders do this without question in the name of the victims and common sense. If we are to change the conversation and change the culture, we need more than memorials, thoughts, prayers, flowers, etc. WE NEED ACTION. Get involved in the name of the victims and just because losing 90 Americans a day to gunshot injuries is not normal and not acceptable. Let’s get to work. We ought to be angry. We ought to be outraged over the madness that is gun violence. There are a lot of things about which to feel outrage in this political atmosphere. One of them just has to be the continuing devastation of gun violence in our country- in every state. We ought to be outraged that we aren’t talking about the risks of gun ownership that causes so many senseless and avoidable deaths and injuries. We ought to be outraged that so many people who should not be able to get their hands on guns get them anyway because we have failed to pass measures to stop them. For example- A St. Thomas University (Minnesota) student, handling a gun in a dorm ( where guns are not allowed by the way) “accidentally “discharged the gun and injured another student when a bullet went through the wall of a dorm room. A University of St. Thomas student was accidentally shot Friday night inside a residence hall, authorities said. The student was injured seriously enough to require surgery after a gun was accidentally discharged in another room, sending a bullet through a wall in Flynn Hall, the university said Saturday. Guns don’t shoot people of course. People do. Their names are Maria McIntosh, Wade McIntosh, Olivia McIntosh. Madness it is. It happens every day in America because we have done nothing to stop it. This more recent article details the angry phone call between the parents of the young child before the shooting occurred. It appeared that there had also been domestic abuse but not documented. Yes, it was purposeful and happened because of anger, anxiety, custody of a child, loss of control and…. an available gun. Witnesses reported seeing gunfire coming from one of the vehicles and directed toward the other around 8 p.m. on County Road 21 near Carriage Hills Parkway, said Police Chief Mark Elliott. Why? We will hopefully find out but the reason doesn’t really matter does it? All we know is that these two irresponsible gun owners decided to “solve a problem” with guns fired from moving cars not thinking about where the bullets would end up. Bullets do fly for long distances and often hit innocent “targets”. The charging document continues that Johnson cooperated with police, saying he met Glover at Don’s Car Wash a couple months ago. Johnson said he was the manager there, and had recently fired Glover. He also explained that he was letting Glover live in his garage, adding Glover was “a really good guy” and had gotten “caught up in some s***”. Johnson said another friend made allegations that Glover had stolen some coins and was going to come over to see if they were there. The documents also say Johnson admitted to snorting methamphetamine earlier that day. He goes on, describing how he started boxing up Glover’s belongings that were in the garage, also talking about how he thought Glover may have tampered with the ammunition in his gun. Johnson says Glover arrived about a half hour later, walked up to the garage and an argument broke out over the theft accusations. Glover, documents say, pushed past Johnson, saying he was going through his stuff to look for drugs. Johnson says Glover came out of the room in the garage, Johnson held the pistol up and Glover said “you pull a pistol on me?” and “I’m going to break your f****** neck”. Johnson told police Glover was 4-5 feet away and he pulled the trigger, but the gun misfired. Documents say Glover took a breath and froze. Johnson says he started pulling the trigger again, this time the gun firing, Glover saying “you shot me” over and over. Johnson said Glover started towards him then, and Johnson fired two more times. See if you can figure this one out. It seems that drugs were a factor. Paranoia. Anger. Suspicion. And a gun was available. Two men who had worked together, one for the other, are now forever linked together by a shooting. One is dead. The other is charged for murder. Nothing will ever be the same. And for what? I guess one could always say that shootings are strange because they are not normal. The gun lobby seems to believe they are because as long as their second amendment rights are preserved there are bound to be some consequences. The consequences are death and injuries. Both parties had been shot in the head in an attempted murder-suicide scenario, said Sgt. Bob Stein, an investigator with the Grand Rapids Police Department. The boy remained in critical condition Friday in a Duluth hospital, Stein added. “He’d been suffering with depression since the age of 14,” said Stein of the elder Krauss. A 9mm handgun was found at the scene and is presumed to have been the weapon involved, Stein said. The man had a valid permit to carry a concealed weapon and had purchased the gun on March 22, Stein said. Is this what we have come to expect now? People with guns in their homes can and do use them to commit tragic acts like this one which would have been far more difficult without that gun accessible. Another Minnesota family is devastated by gun violence and will never be the same. It was purposeful. The shooter had a valid Minnesota permit to carry that gun. He was supposed to be safe and responsible with the gun. But he wasn’t. Why did he have a permit? Under the loose “shall issue” permitting system in Minnesota it is assumed that people who get their permits do not have problems that could make them dangerous to themselves or others. This is not the case, of course. “He came in, and very, very quickly upon entering the classroom started shooting,” Burguan said. Anderson also reloaded after firing what is believed to have been a .357-caliber revolver, the police chief said. Burguan said preliminary information indicates the two were recently married. Her name was Karen Smith. The thing is, people often don’t see it coming. But when a gun is available to settle what the shooter believes is a problem or is jealous or angry or depressed, things happen quickly and we learn the story later. I know this one from personal experience. (Her name was Barbara Lund). Court records showed that he had faced criminal charges of brandishing a weapon, assault and crimes against public peace in 2013, with those charges later “dismissed or not prosecuted.” There had also been two petitions for temporary restraining orders filed against him by women in previous years. California does have strict gun laws. We don’t know how or where he got his gun. Guns are often available to those who want them through many channels. And since we have not chosen to close the channels, we have come to expect that these things will happen. Whether purposeful or accidental, what I know and what the stories tell us is that we need a whole lot more common sense and courage to prevent some of these shootings. Both seem to be in short supply. Some states, including my own, have passed laws to remove guns from domestic abusers. This seems like a very good idea given what we know. But until we pass even more laws, such as universal Brady background check laws to prevent prohibited purchasers from getting their hands on guns no matter where they go to buy them, we are failing women and children. And one bill that has been introduced in Minnesota ( and other states and passed in California) is a Gun Violence Protection Order. Of course as long as lapdog politicians are in charge of legislatures and the Congress, this, too, does not even see the light of day. And we are failing our families because of this lack of courage and conviction. As long as we let the gun lobby make the rules and hijack the conversation, we are failing our families. I don’t know about you, but I will not stop working to prevent and reduce the devastating gun violence that has affected so many families and communities in my state and in our country. It doesn’t have to be this way and I just know we are better than this. Are you angry and outraged yet? Let’s get to work and insist that our leaders do something about our serious public health epidemic of gun violence.